A $3.8-million renovation of the Central Library caused one local resident to gush when she saw it. The RRMM-designed building – which now has an address on Lucy Corr Boulevard – opened July 30 after an 18-month renovation. Jennifer Hayek, library branch manager, was also excited. She has worked in that capacity for four years and has been with the Chesterfield County Public Library system for over 10 years. One of the highlights of the library is “The Shell,” a previously unfinished area that has big windows, a stage and houses the library’s fiction, local history, law and small business center. Hayek said the stage may be used for some live music performances, including an amateur acoustic group that hosts jam sessions the second and fourth Tuesdays from noon to 1:30 p.m.
An introduction to genealogy class may also be held in The Shell, Hayek said. 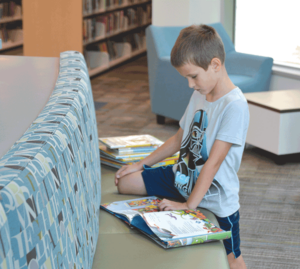 Other features of the refurbished library include several collaborative learning stations that have been set up throughout the building, a “makerspace” room that includes two new Dremel 3D printers and four rooms that can be reserved for meetings. 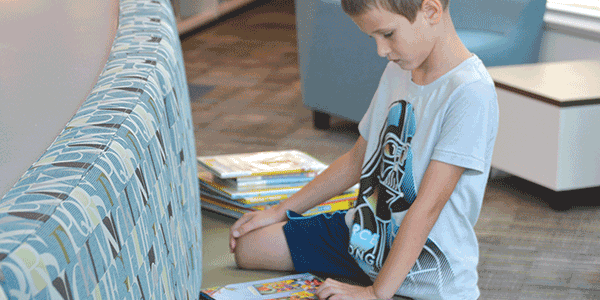 A window that the library children’s section shares with the Cooperative Extension will enable youngsters to watch “science in action,” extension agent Mike Likins said in May. The Cooperative Extension relocated to the Central Library in late February from the old clerk of court’s office in the county governmental complex. Although libraries may not be what they used to be, Hayek notes that two study rooms and one quiet room are available on a first-come, first-served basis. Visitors may notice any one of six librarians roaming around the building with an iPad in hand that allows them to communicate with staffers at the circulation desk. A library without computers would be out-of-date, and the Central Library has plenty, including 15 available for research for up to one hour, along with two express computers that can be used in 15-minute increments. Modern furniture can also be seen throughout the building.